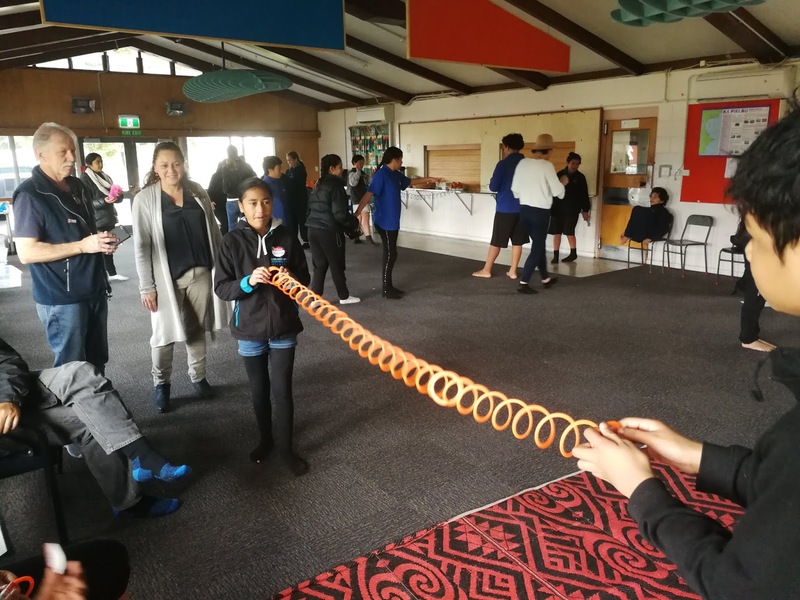 GNS science recently ran four three-day natural hazards science camps for intermediate level students in New Zealand's rural Tairawhiti (Gisborne - East Cape) region. 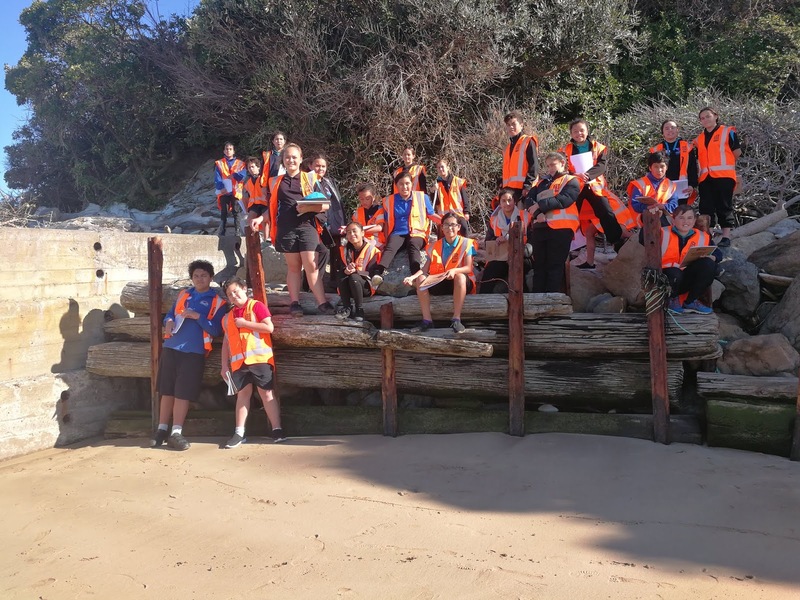 A total of 109 year 7 and 8 students and 16 teachers, from 19 schools were represented. 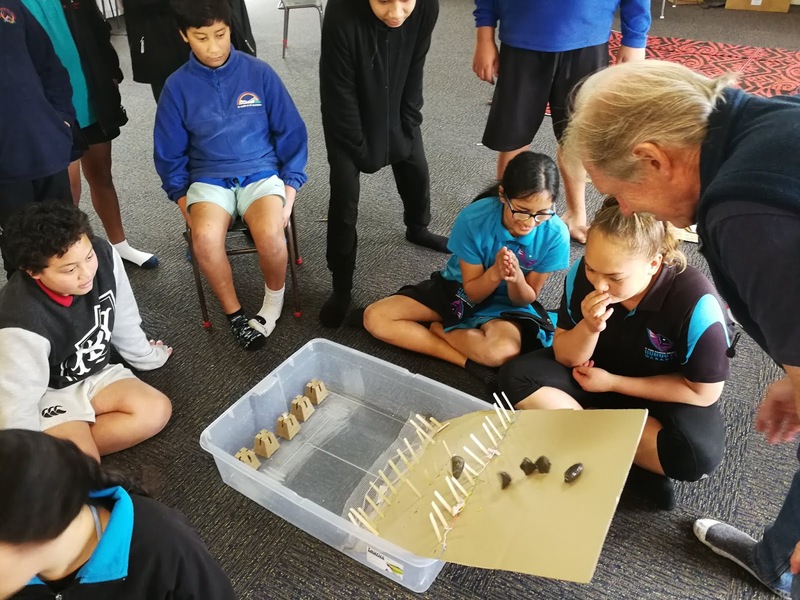 The science camps were based at four different locations (Gisborne, Te Karaka, Tolaga Bay and Ruatoria / Te Araroa) with the activities and field trips tailored to suit each area. 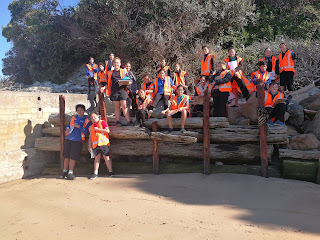 The events included lots of field trips and hands-on problem solving tasks. 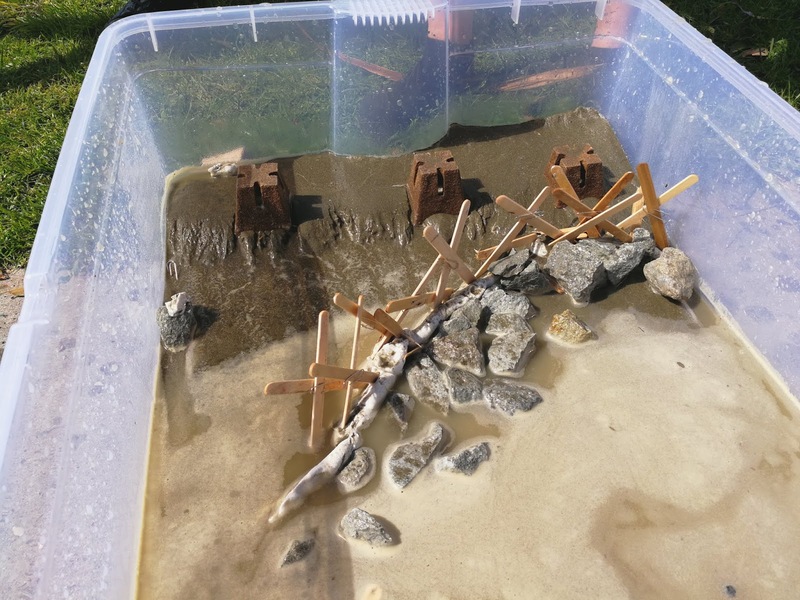 Introductory activities included observation and thinking exercises around the theme of science and natural hazards. These included demonstrations such as: earthquake P (longitudinal) and S (transverse) waves using slinky springs. A TC1 seismometer was used to demonstrate how ground shaking (created by participants jumping on the floor) can be captured as a wave trace on a projector screen, giving a record of the magnitude (energy) and duration of the vibrations. 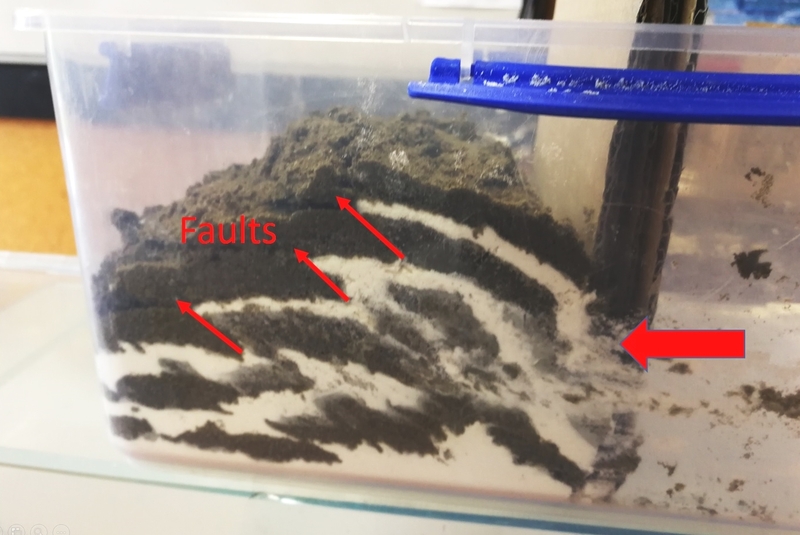 Rock deformation: Alternating layers of flour and sand in a transparent container show how rocks can be faulted and folded by compression of the earth's crust. For information about this demonstration have a look this earthlearningidea.com page. 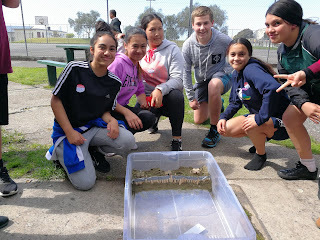 Testing involved using a plastic lid to push the water in waves up against the seawall, first gently, then with increasing energy. Different designs could then be compared and strengths and weaknesses discussed. 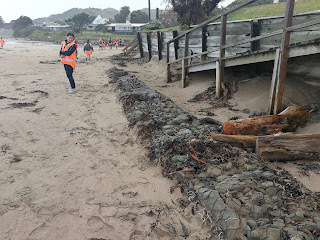 Following this exercise we travelled to Wainui Beach, Gisborne where there has been a variety of attempts to protect the foredunes which have properties built on them. Another similar model making exercise, this time including a slope of cardboard at one end, was to design rockfall barriers. These were also tested to destruction using varying quantities and sizes of rocks rolled down the slope. We were also able to do another activity associated with flooding which has been a big issue this year in the Gisborne area.The photo shows the sediment covering some of the farmland near Te Karaka following the floods. 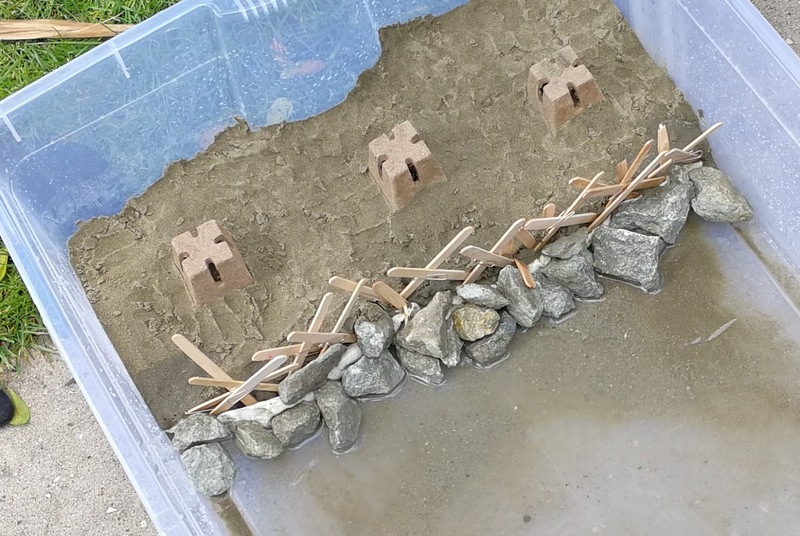 For this activity, participants had to design a stop-bank, and test how long it could retain water, by recording any pooling of water on the 'dry' side , every 30 seconds. 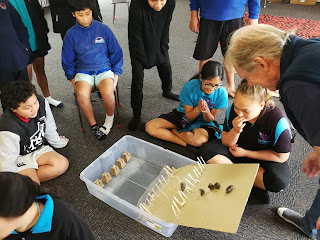 If you are an educator wanting information sheets to run these activities they can be found on the GNS Science website learning pages here. At Pouawa Beach, north of Gisborne, we made careful drawings of some deposits that are thought to have been laid down by a tsunami. 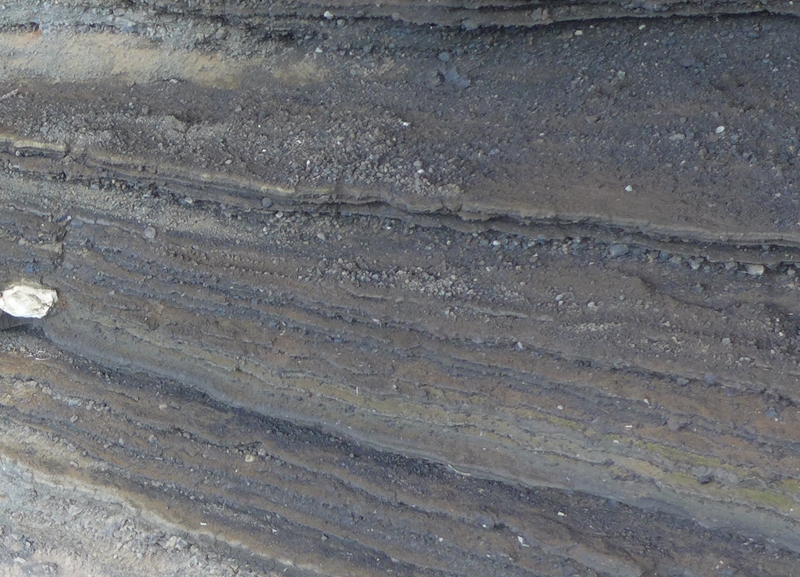 Shells in these layers have been radiocarbon dated at about 2000 years old. The layers include gravel and shells that would have been transported from the sea floor. Using a drone we could get a good view the top of a marine terrace (the flat surface upper left of pic) at the north end of the beach. The terrace was formed at sea level as a wave-cut platform during the last interglacial (about 80 thousand years ago), and has been uplifted since its formation by tectonic activity. There is a wide shore platform which you can see just covered by water in the photo. 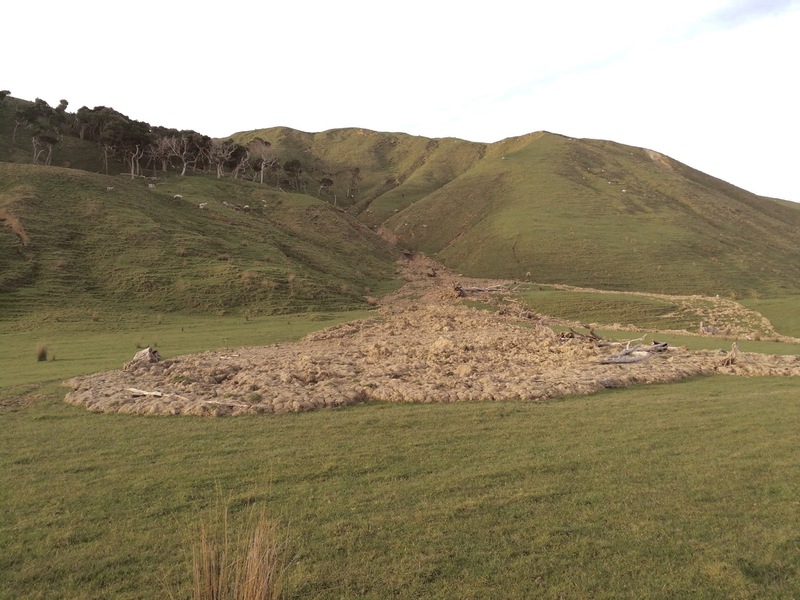 Another great example is nearby at Tatapouri - for more information check out the GeoTrip here - these surfaces will also be uplifted eventually to form another step in the landscape. These marine terraces show that earthquakes and tsunamis have a long history on the East Coast! At the north end of the beach. 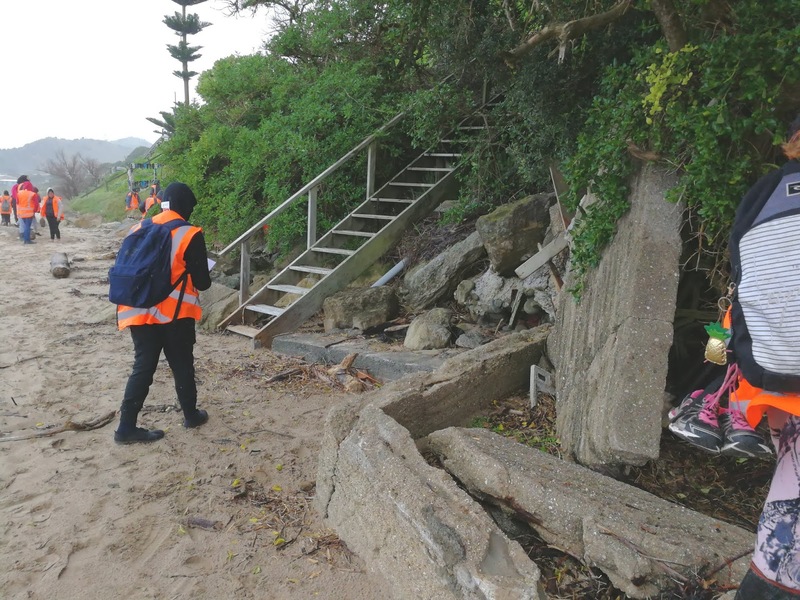 we passed a landslide that had occurred during the very wet weather in June 2018. 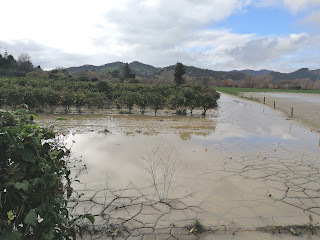 From the ground we could see the toe of the slip which included tree trunks, boulders and lots of muddy sediment. 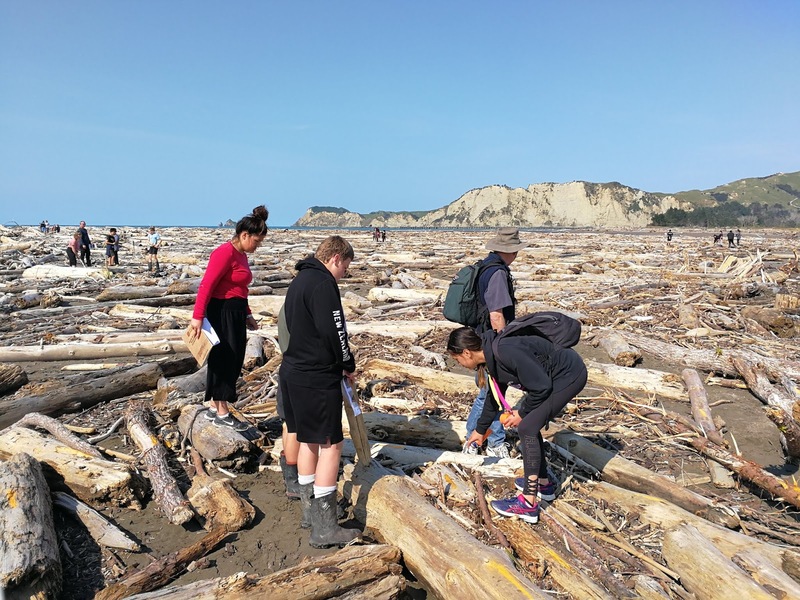 Next stop Tolaga Bay, where the beach has been covered by logs, brought down from the forestry plantations by the recent heavy rainfall. The logs caused a lot of damage to properties, bridges and land as they travelled down the flooded rivers. 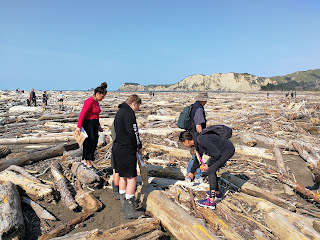 Here we spent some time analysing the types of logs scattered on the beach, by counting the different species (pine, poplar, willow or other) within 10m square quadrats. The results showed that by far the majority came from pine forestry. 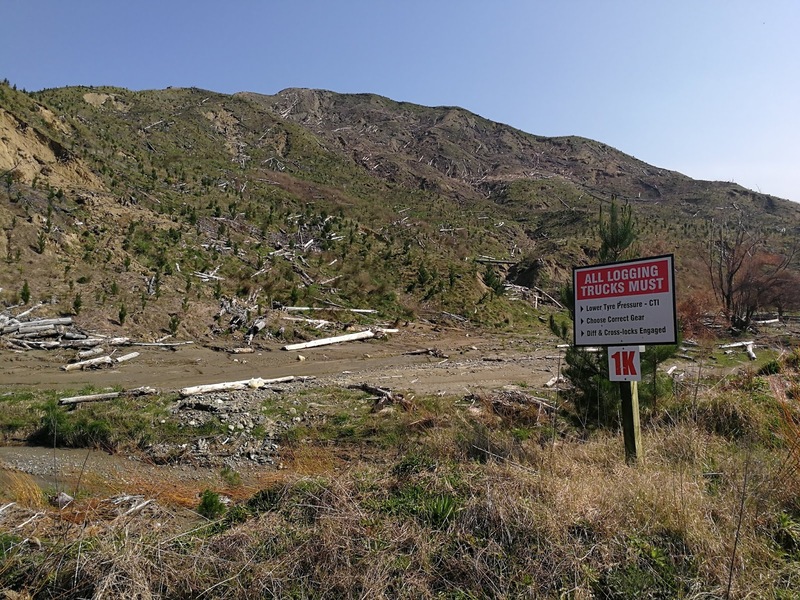 We were able to visit a forestry area inland of Tolaga Bay, which showed that following harvesting of the pine trees, there is a period of time where the land is vulnerable to erosion before the next generation forest grows large enough to stabilise the soil. Following clear-felling, the slash (abandoned logs and branches) can get washed into rivers during heavy rainfall. Further North still we did a day trip to the Tapuaeroa River where a number of features of the landscape and geology were investigated. 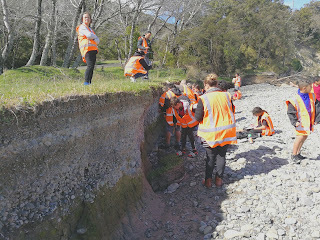 The sediments in a river can tell you about the geology of the catchment area, and also a lot about landscape change. 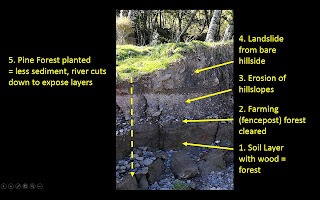 By carefully recording the different layers, we were able to deduce a possible history for the area. The soil layer at the base included wooden roots and branches, representing the original forest ecosystem. At the top of the soil we found a buried fencepost - indicating farming activity, and presumable forest clearing. 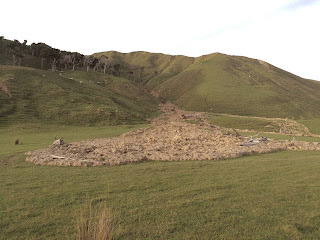 Above that the gravel and landslide deposits show faster erosion probably due to the reduction in forest cover. 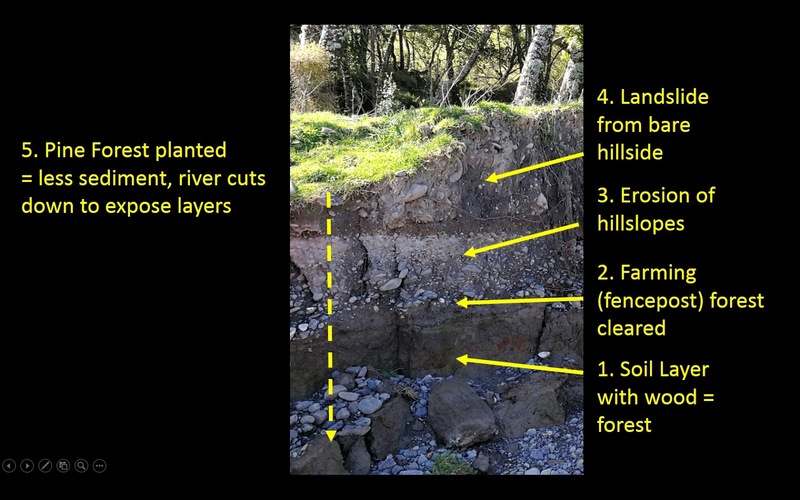 Finally the downcutting by the river to produce the cliff section shows reduced sedimentation, related to the planting of pine forestry.. The small river cutting contained a microcosm of changes that had affected the wider landscape going back to pre-european times. 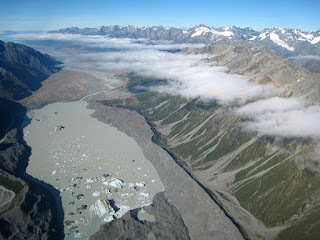 This image shows Mt Hikurangi in centre left, with the Tapuaeroa river beyond, leading to the broad Waiapu River in the further distance. 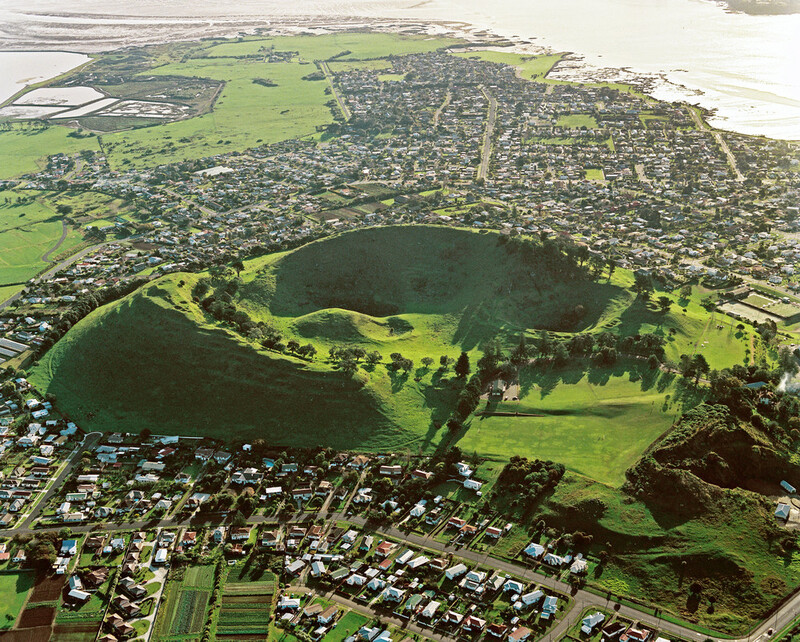 Volcanic cones, explosion craters and lava flows form much of Auckland's natural topography. All of these, apart from one (Rangitoto Island) are from vents that erupted once only (monogenetic), with eruptions lasting a few weeks or months and then ceasing completely. There are many accessible and beautiful locations that can be visited to uncover the geological history of the area. 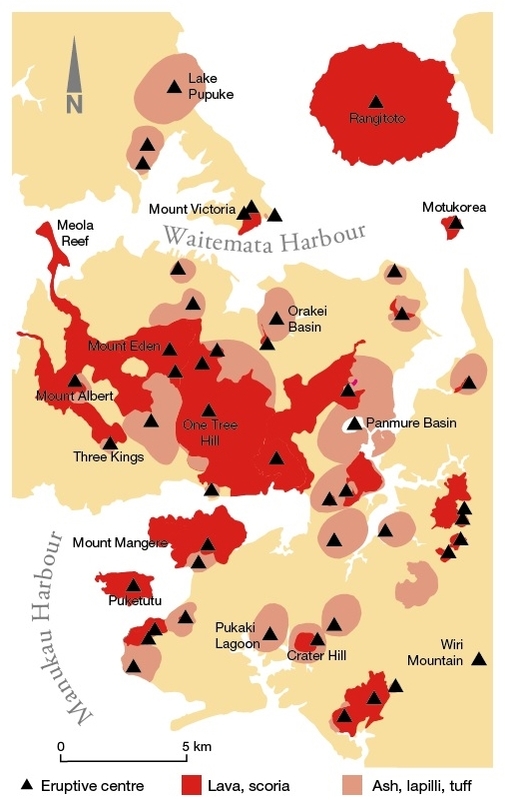 Although there are about 50 volcanoes within a 20km radius of the city, there is a similar eruption process that generated them, with three main possible styles of eruption. Knowing the difference between these eruption styles allows you to interpret the different features and rock types of each of the volcanoes that you might wish to explore. 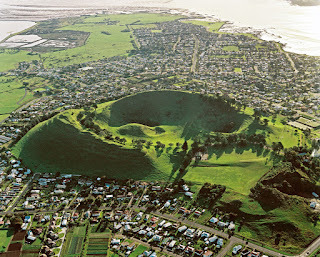 The magma that erupts in the Auckland Volcanic Field (AVF) is generated in a 'hotspot' about 80 to 100 kilometres below the surface. It is a very fluid type of basalt that is known to rise quickly to the surface (at up to 5km / hour) from the magma source. Once at the surface, the style of eruption depends largely on the amount of groundwater or sea water present. If there is a lot of water near the vent, its interaction with the hot magma (1000 plus deg C) causes it to instantly vaporise. This, along with the expansion of gases within the lava itself, creates extremely violent eruptions that fragment the lava into small particles and blasts them upwards and sideways from a wide, flat explosion crater. This becomes surrounded by a ring of ash. 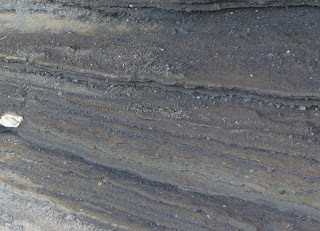 Such deposits are known as tuff (pronounced 'toof' as in 'woof'). You can see outcrops of this in Auckland, for example around the shoreline at North Head. Each individual layer represents an explosion from the vent. This type of eruption is known as a phreatomagmatic or wet eruption, and a classic example occurred off the coast of Iceland from 1963-67 when the island of Surtsey was born. If the magma reaches the surface where there is little interaction with water there is a different type of eruption. This includes eruptions in areas of dry land, as well as those that start off as wet eruptions, but where the water supply near the vent gets used up before the supply of erupting magma runs out. 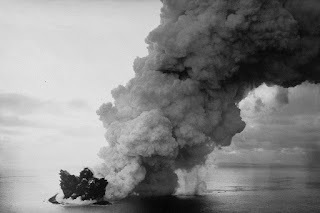 The magma then erupts in a fountain of lava, driven up by gases within it that are expanding as the pressure is reduced. The lava fountains might be several hundreds of metres high, with blobs of lava partially solidifying in mid-flight, and landing as scoria in a ring around the vent. This is a bit like the froth coming out of a soda bottle once the lid has been removed. The scoria pieces and lava bombs are relatively sticky and can build the steep sided cones that are very recognisable in the Auckland landscape. The reddish colour comes from the oxidation of iron in the magma as it cools during its flight through the air. If you look at the rock that makes up these cones, you will see that it is made of bombs and fragments that may be partially glued together or more or less loose and rubbly. 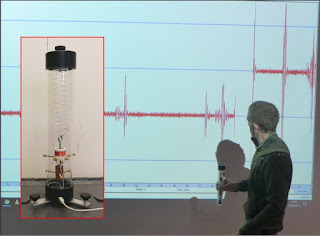 If one of these eruptions gets to the stage where the gas has mostly been expelled, then there is less energy available and the fire-fountaining stage ends. Should the eruption continue (which is not always the case) then the third eruption style starts to dominate. 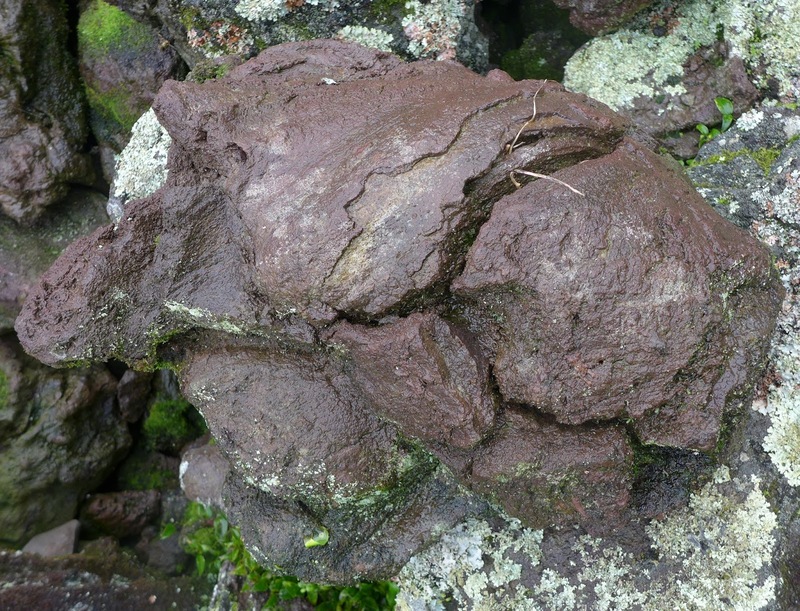 Lava pours out of the vent and pushes through the sides of the scoria cone to spread out around the volcano. Because it is such a fluid type of lava, a variety of flow structures are preserved when it finally solidifies. surrounded by the lava which cooled around them. The trees then burnt, leaving tree shaped holes within the lava. 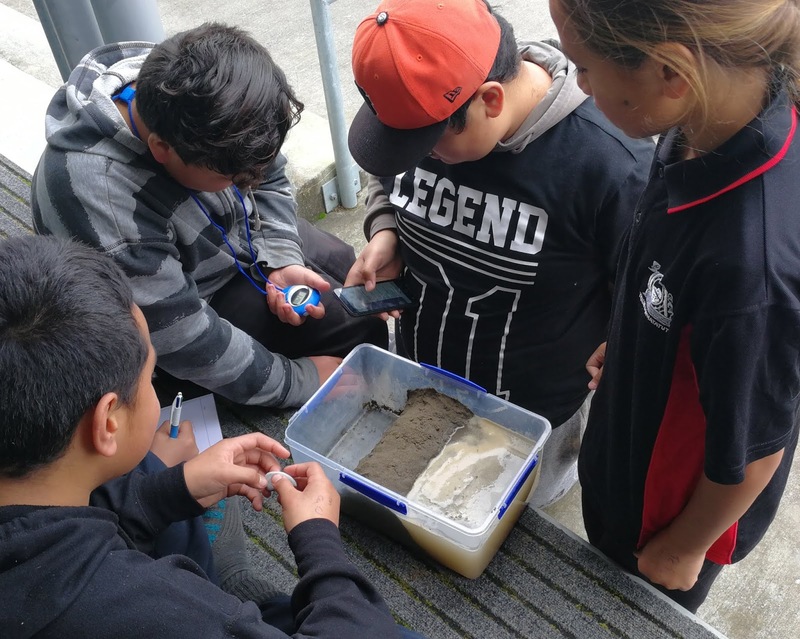 Could a volcanic eruption occur in Auckland in the future? What are the probabilities in the short to medium term and what would the impacts be? The short answer to the first question is 'Yes, definitely!' There is no reason to think that eruptions won't occur again. In order to answer the last two questions ('When?' and 'What?') 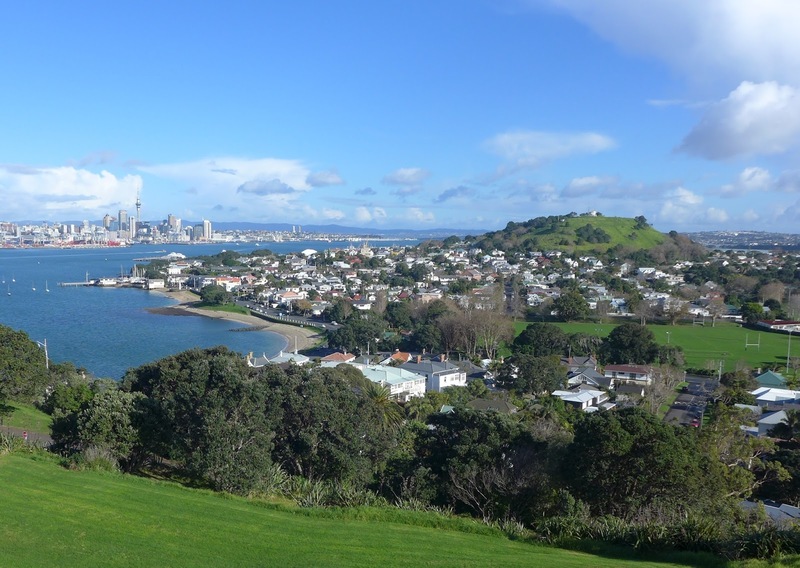 it is important to get as clear a picture as possible of the history of past events, their timing, duration and magnitude, and their geographic relationship to the housing and infrastructure in the wider Auckland area. 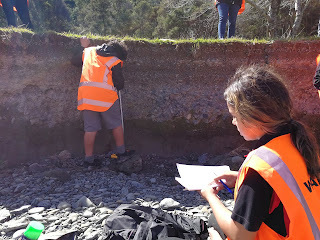 These questions are the focus of a long term scientific programme called DEVORA (Determining Volcanic Risk in Auckland). DEVORA is led by GNS Science and the University of Auckland, and is core-funded by the EQC and Auckland Council. The first part of this programme has been to further our knowledge of the eruption history of the Auckland Volcanic Field volcanoes. What this work has shown is that there is no simple pattern that we can project to help easily forecast the likelihood of eruptions in the future. The timeline of eruptions shows them to be clustered, with large gaps between phases of relatively high activity. Graham Leonard of GNS Science is a co-leader of the project. He comments that: "Some eruptions flare-up over what is, geologically speaking, a short period of time. For example, there can be 6-10 volcanoes erupting within a 4000 year timeframe. On the other hand, the volcanic field has also gone quiet for up to 10,000 years in the last 60,000, which is quite a long gap." For more information about the DEVORA research have a look at this media release. 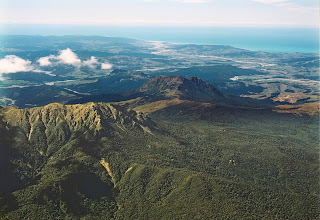 New Zealand is an isolated country with a very active plate boundary running right through it. 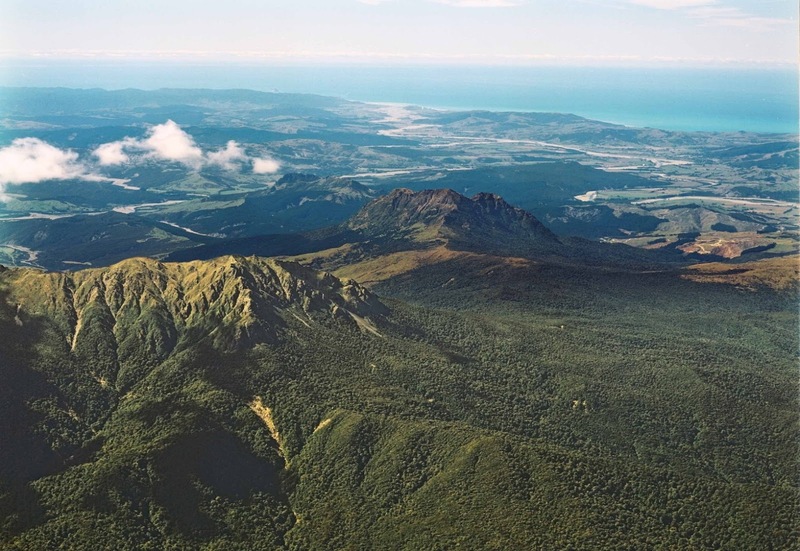 For a relatively small landmass it has an astonishing variety of landscapes and is being continuously subject to dramatic physical occurrences that include earthquakes, volcanic eruptions, floods, landslides, rapid erosion and sedimentation. 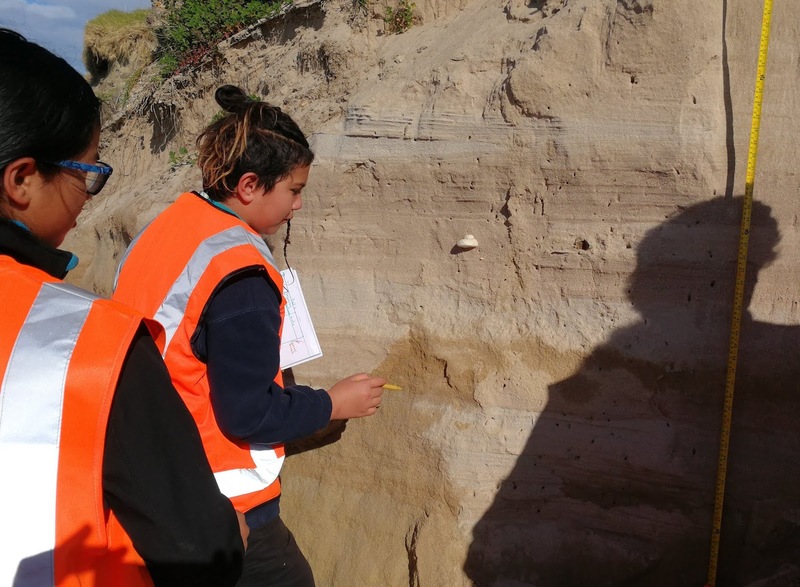 The geology of New Zealand can be explored in innumerable individual localities that each give individual insights into the geological story, like pieces of a jig saw puzzle. In order to visit these locations, a non specialist normally has to find information in widely scattered sources such as specialist papers, local guidebooks, various websites or visitor centres. Many of these are out of print or out of date, and hard to get hold of. To overcome this issue, GNS Science has created a New Zealand geological locations map that allows members of the public, teachers and students to have the information they need to explore our geology first hand. 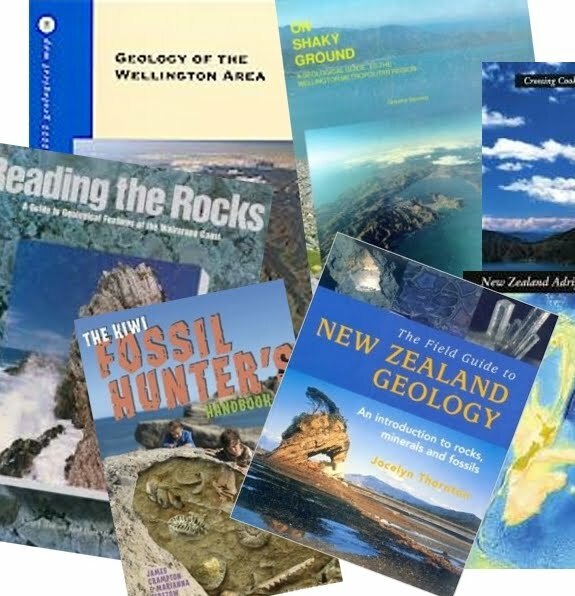 The content is provided by geoscientists and is aimed to encourage you to go to these localities and make your own observations, just like scientists do. 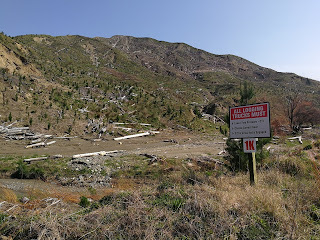 As well as some geological background, there are images, directions, and some basic safety and accessibility information too. You can search the map using filters to focus on specific topics, rating scales or accessibility. 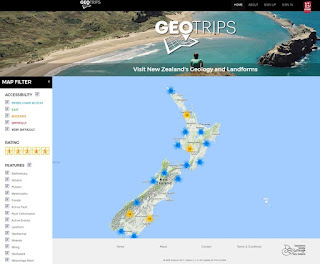 Please sign up to GeoTrips and comment on and rate the locations that you visit! We are planning to further develop the site and continue to expand the number of locations shown. 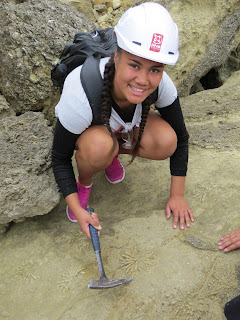 So... have a look, explore and plan some trips to become a New Zealand geological investigator! 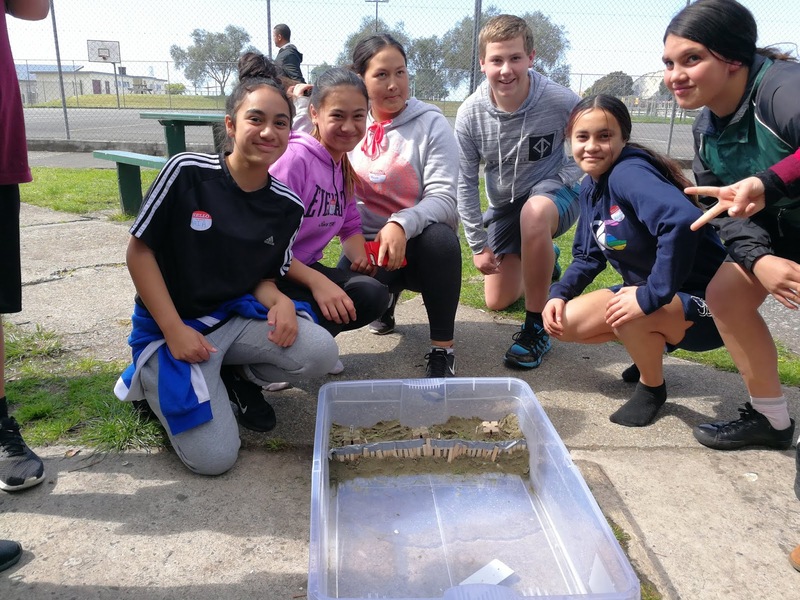 A blog post by Tanja Petersen and Neville Palmer from their recent GNS Science trip to Antarctica to measure the Earth's Magnetic Field. 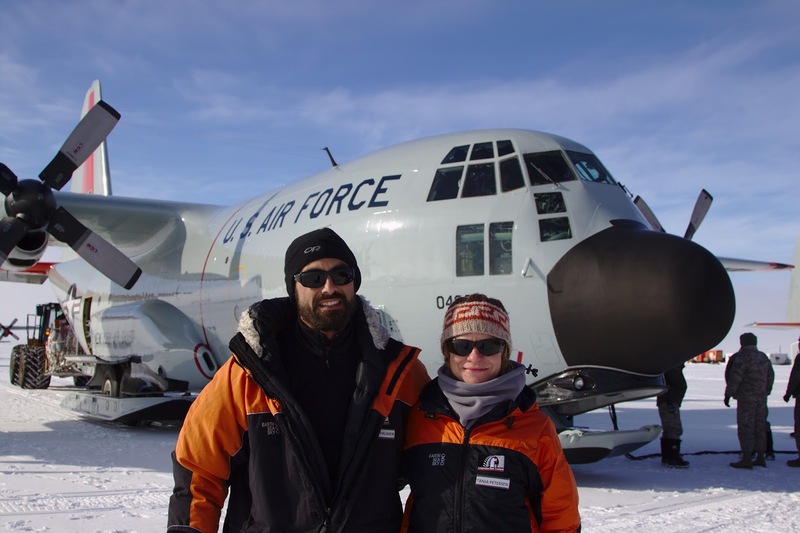 It took 8 hours for the Hercules aircraft to fly from Christchurch to Williams airfield, a runway on the Ross ice shelf close to Scott Base. 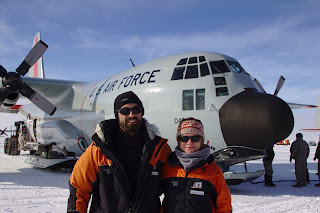 Both of us had never been to Antarctica before; we had a big smile on our faces when we stepped out from the airplane onto the ice being greeted by dry crisp cold air and what seemed like a never ending blanket of snow. Read up on the Hercules – it is a quite fascinating aircraft and has been around since the 50s! The view from Crater Hill, a volcanic cinder cone on the foot hills of Mt Erebus, provides a fantastic overview of the settings of Scott Base. 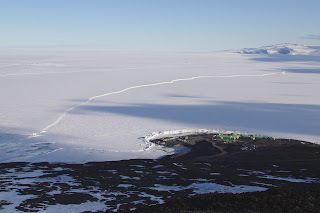 You can see Williams airfield (upper left corner); the boundary between the thick ice shelf and the thin sea ice meanders diagonally through the photo towards White Island in the distance. 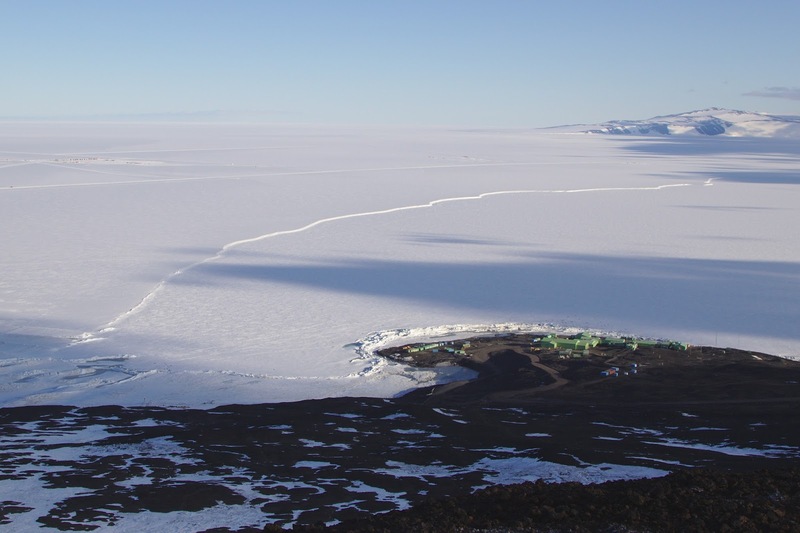 The pressure ridges on the sea ice are semi-circling the green painted buildings of Scott Base. 10pm at Scott Base. 24-hour sunlight! Looking out from the back towards the two geomag huts (left). We are here to measure the strength and direction of the Earth’s magnetic field at two locations in the Ross Sea area, Lake Vanda & Cape Evans, where people have been repeatedly measuring it since 1974 and 1911, respectively. 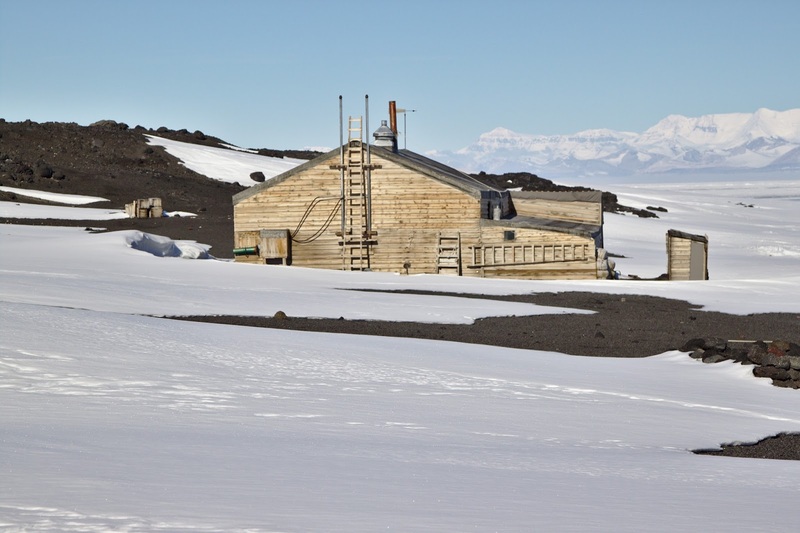 And we also want to check up on our equipment inside the two little green huts outside the back of Scott Base, which is continuously recording the local variations of the Earth’s magnetic field. One of the many corridors inside Scott Base connecting the buildings of different sizes and shapes. Corner, stairs up, another corner, stairs down … a bit of a labyrinth for a newbie! 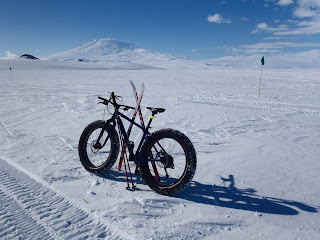 Häglund snow vehicle to the left, Mt Erebus in the background, a toilet tent, two sleeping tents, some shelters built into the snow and a flag marking a safe route. The inside of Scott Base is being kept warm & cosy at T-shirt temperature, but outside it is more like -6 to -12 degrees C (including wind chill – important factor!). The Antarctic Field Training is giving us a good practice run on how to keep warm outside, before heading into the field. Antarctica New Zealand provided us with heaps of layers of warm clothes to wear. We then were ready to load up the helicopter that flies us from Ross Island to Lake Vanda, in the Dry Valleys, 125 km away on the Antarctic mainland. The Wright Valley with Lake Vanda in the distance. Our fieldwork in the Dry Valleys, Antarctica, begins. 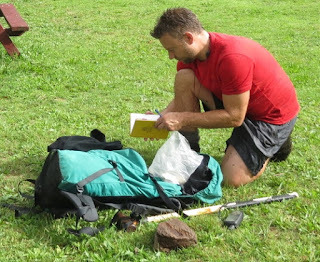 First thing is to set up the fluxgate magnetometer near the Lake Vanda camp, before we walk to the nearby repeat measurement sites to get readings of the strength and directions of the magnetic field. Neville is measuring the directions of the Earth’s magnetic field at Lake Vanda. In 1767 the South Magnetic Pole was located around here; now it is about 1720 km away. We are repeating these measurements several times over the course of four days. Tanja on a special mission – the “P bottle” is part of keeping the environment as we found it. After those four days working at Lake Vanda we continue to Cape Evans, Ross Island, Antarctica for a day. The historic magnetic hut there was constructed in 1911 as part of Scott’s Terra Nova expedition. It has asbestos in its wall panels; its structure is protected by a plywood construction around it. 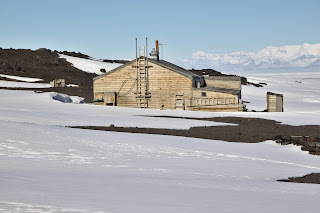 Inside that hut is the wooden pillar that Captain Robert Falcon Scott and his team of explorers used to take magnetic measurements before heading into their ill-fated expedition to the South Pole. Over 100 years later Neville performs the same type of measurements, but in a slightly different outfit. The Terra Nova Hut nearby. Captain Scott's base for his explorations of the frozen continent, in the early 1900s. It was also used by Shackletons's Ross Sea party. 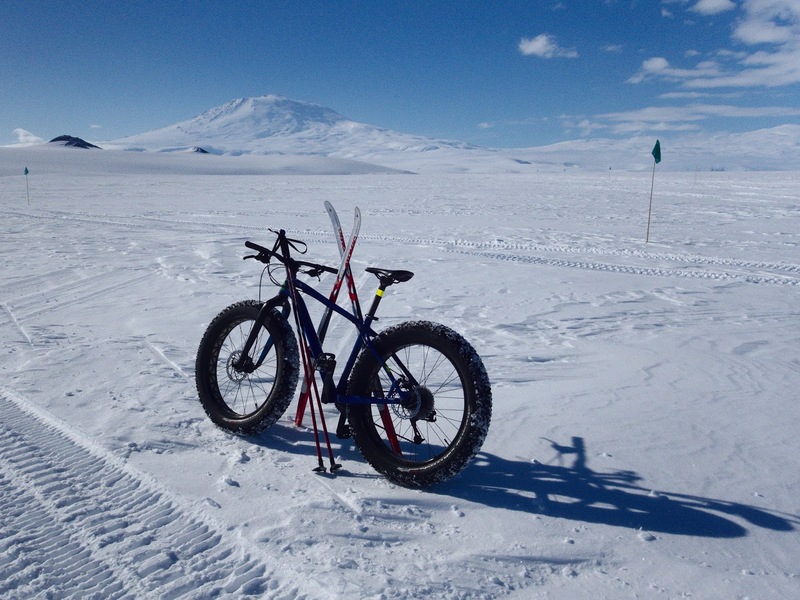 After completing our work successfully our flight back gets delayed and we have a bit of time for some recreational activities on the ice shelf close to Scott Base before heading home to New Zealand.